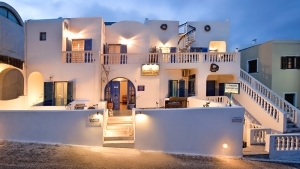 Asteras Villas is built on the cliffs in the town of Fira, just a few metres form the main street in Fira, looking towards the the Aegean Sea. 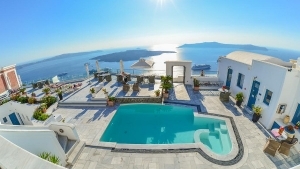 Each suite offers spectacular views to the Caldera, the famous volcano, Thirassia Island, the picturesque village of Oia and the famous Santorini sunset. They are all decorated with elegant and modern furnishings. Every suite has a large private veranda. 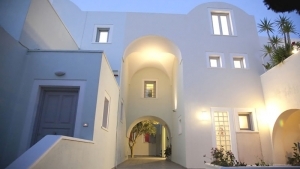 It is located near the station of public transport for the island, only 10 minutes away from Santorini airport and 15 minutes away from the port of Athinios (by car). The famous Red Beach and Black Beach are about 20 minutes away by public transport. 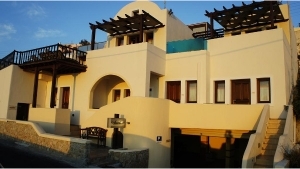 You can also easily rent a car from the reception to help you visit all other beaches and the villages on Santorini. Terrace, Non-Smoking Rooms, Express Check-In/Check-Out, Safety Deposit Box, Soundproofed Rooms, Heating, Luggage Storage, Air Conditioning. Services: Room Service, Laundry, Dry Cleaning, VIP Room Facilities, Breakfast in the Room, Ironing Service, Bridal Suite, Bicycle Rental, Car Hire, Tour Desk, Fax/Photocopying, Concierge Service, Shuttle Service (surcharge).